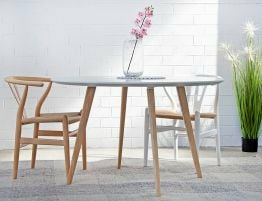 First created by Italian industrial designer Mario Cellini as the Halo Dining table, our precise reproduction Aura Dining Table 160 x 90cm Rectangle - Natural offers all of the on-trend styling and impeccable construction as the original. 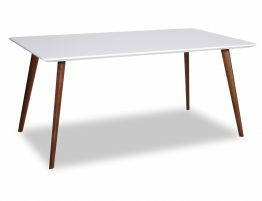 Minimalist design adds to the beauty of the Aura Dining Table bringing a fresh modern look to your eating areas. 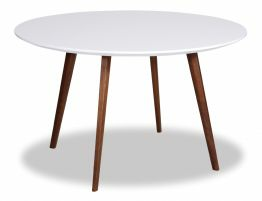 Cigar shaped timber legs brings a design feature synonymous with architectural shapes in today's designs, pairing with a crisp white resin top. 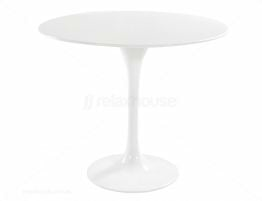 This not only adds style but is durable enough to handle a well utilised area in your household. 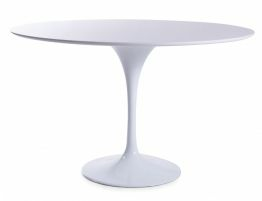 Halo dining table can seat up to 6 people. 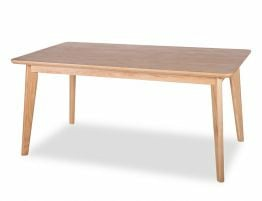 If you have a smaller space the Aura Dining Table will neatly fit without overpowering your room. 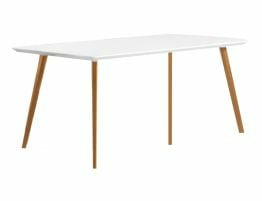 Bring a favorite eating space to life with the slimline design that is Halo dining table.